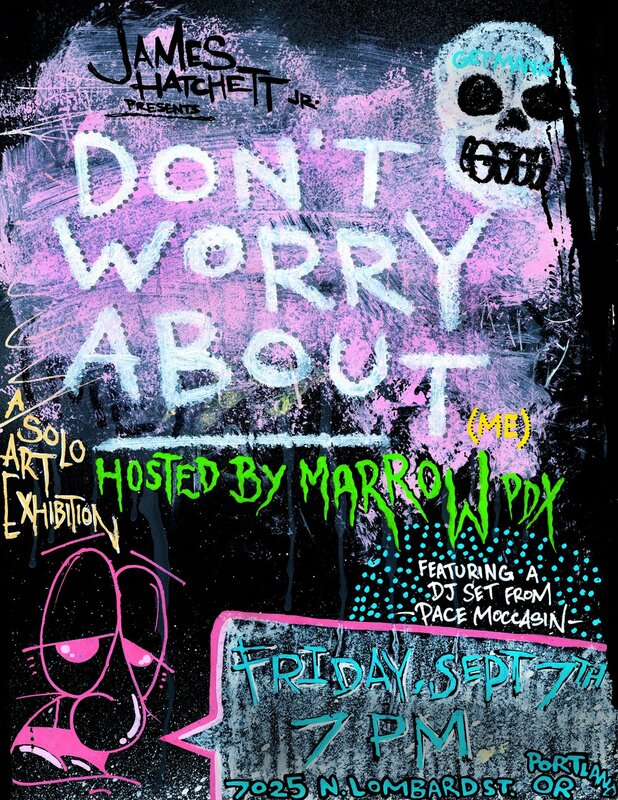 James Hatchett Jr's first solo exhibition, "Don't Worry About (Me)" opens Friday, September 7th, 7-10pm in Marrow's gallery. It will be on view for the duration of the month. Here's a little preview review of the exhibition, in anticipation of it opening tomorrow! James first approached Marrow this spring, wanting to have a go at one of our sad white office walls; to execute his first mural. The finished product was so transforming of our space that it initiated a complete dismantling and reimagining of our storefront gallery and shop. Naturally we offered him an exhibition opportunity, too. It turned out to be James' first solo exhibition, and appropriately it was also Marrow's first solo exhibition of a youth artist in our gallery. For me (as Marrow's director) there couldn't have been a better artist to set the bar with - and James set it high. He is not only talented, but hard-working, kind, and immensely humble. 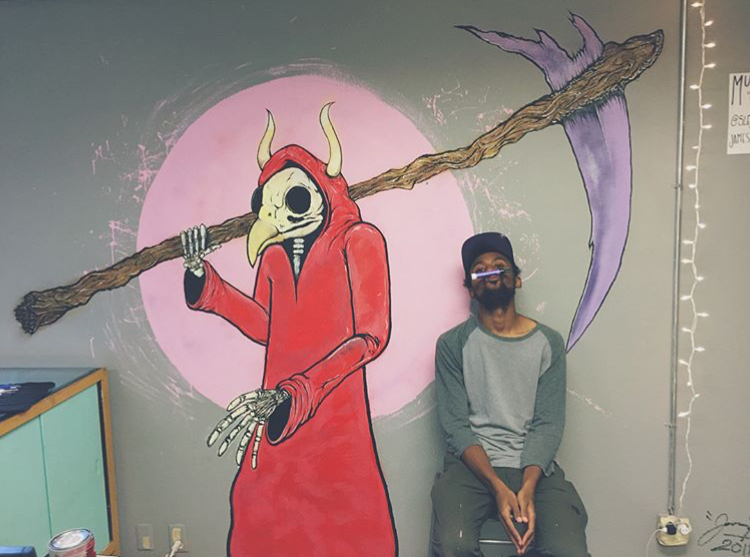 The aesthetic and emotional vibe of James' work reminds me of the artists I was obsessed with when I was his age - particularly Alex Pardee and Jean-Michel Basquiat. Perhaps unsurprisingly, as all three artists' work seem to be an outlet for processing their combat with the monsters of the internal and external worlds they inhabit. They do this through characters, through scrawled text, through vibrant color, and the tiniest hint of panic. Each conveys what it's like to stay connected to an unstable world, with an intact sense of playfulness. Without giving away too much - my favorite part of James' exhibition is not a singular piece, but his cleverness. There's an cycle of discovery, surprise, and then familiarity to viewing James' work. One of the most striking pieces, for example, at first appears to be a toy or other sculptural object (possibly even a weapon) - not uncommon possibilities in this genre of art which has been largely popularized in the Bay area's skate, and rap, and graffiti culture. You get closer though, and realize the object is made up of a handful of inhalers. 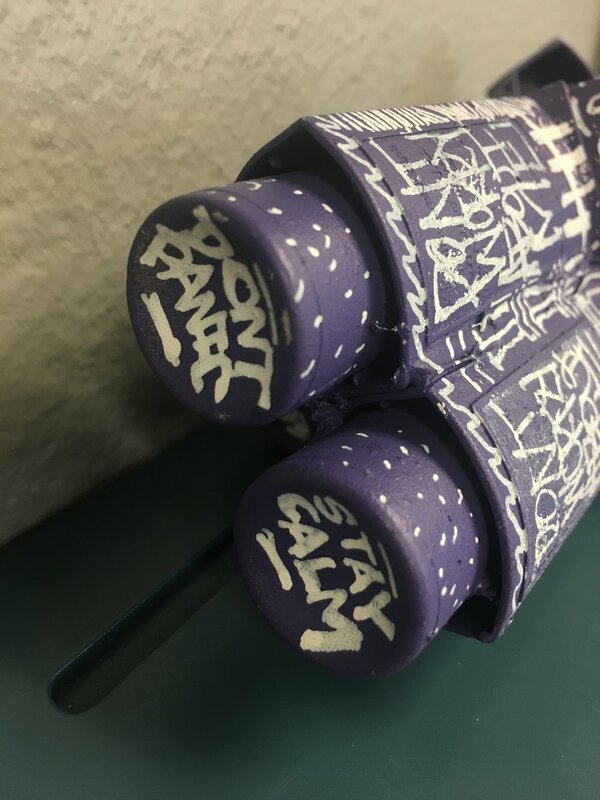 The text scrawled all over; "STAY CALM", "DON'T PANIC", "DON'T WORRY ABOUT ME" is given new and powerful context. I've never had to cope with respiratory issues - but I felt my chest (or maybe my heart) tighten. James' work is full of these types of slow unveilings - each piece requires you to examine and fully digest what he is expressing or working through. 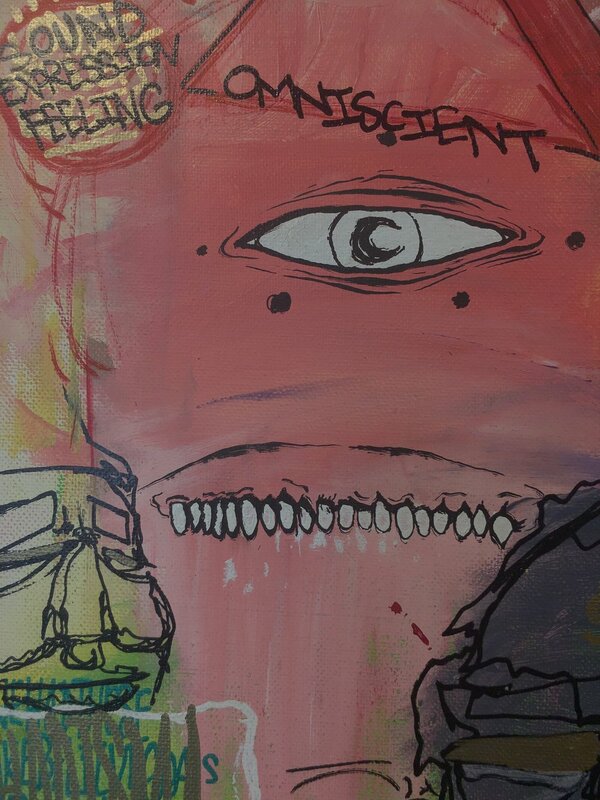 There are messages throughout, and despite the shift through mediums (the show includes both paintings and objects, and his style spans from being heavy on graphic design to very expressive and painterly), the works are undoubtedly from a single cohesive universe. Though the works traverse some potentially heavy content - there is no sense of hopelessness or powerlessness here - rather the opposite. The works are powerful. There is an aliveness and sense of ownership over James' full self. He is here. He is creating. Truly we need Not Worry About (James). If you would like to support this incredible young artist - come to the opening! 7-10pm this Friday the 7th. Ask James about his work, give him some feedback, invite your friends, show up for young artists trying to navigate the art world. I cannot express enough how important this is. Community must be intergenerational. Marrow may focus on uplifting and empowering youth - but to do this, we need everyone. I work to keep this space here because I know the power of being around adults who value young people; of not only feeling like my voice mattered, but being told it did, and then being given a platform to use it. It gave me a sense of agency over my future. Over our futures. 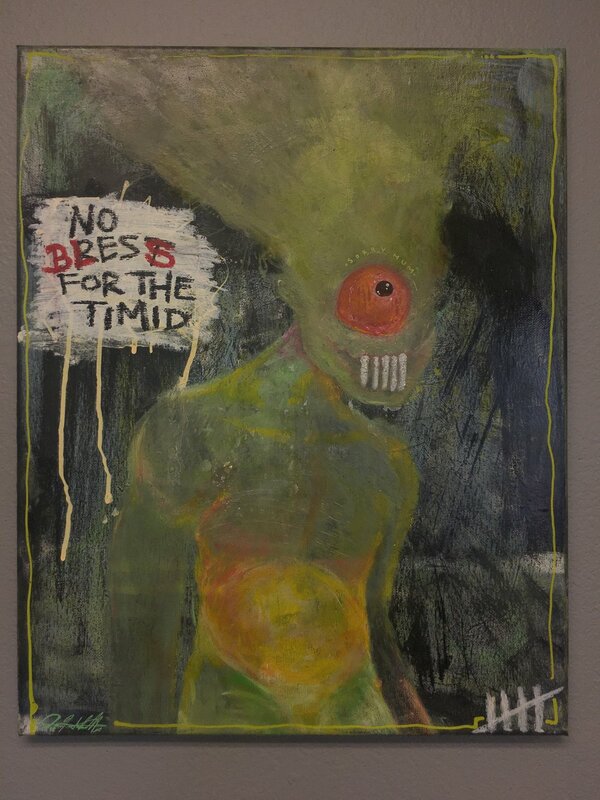 A couple years ago I met Alex Pardee, and I told him what his work had meant to me as a depressed teenager. There was a line of 50+ people behind me crammed into a tiny gallery in downtown Portland, and he took the time to really talk and connect with me, to ensure that I felt seen and valued. The way Pardee's work affected me, James' work is going to matter to a young person, some where, some day - and I know that he'll take that same time to make sure they feel seen when they approach him to say so. So come make sure James is seen, and supported, and uplifted - so that he can continue to have an impact this community through his work. Plus, there will be refreshments, a raffle (with some great prizes), and a DJ set by Pace Moccasin. If you can't make it, stop by any time this month that Marrow is open, and take a look! Sign the guestbook and let James know what you thought! You can also find him on instagram, @sleepymothra. 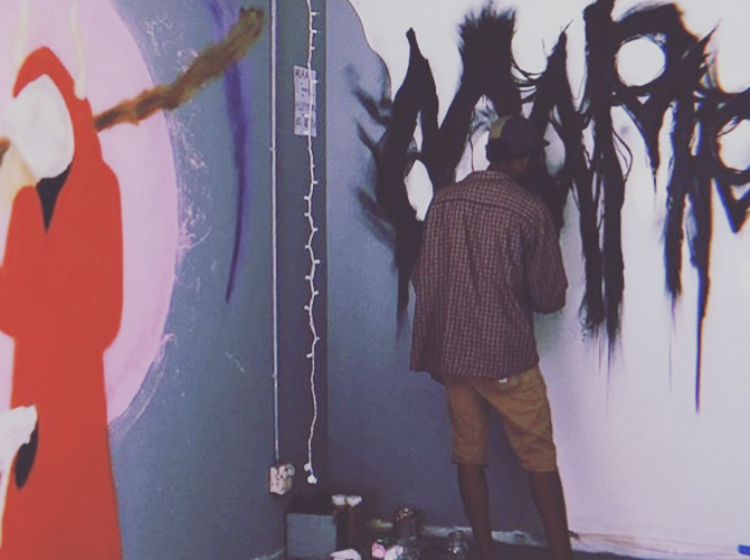 Hopefully soon the responsibility of curating and writing about exhibitions in Marrow's gallery will be passed along to a new youth collective member who's passionate about making an impact in the art world, but for now you get me, Daylynn - Marrow's director and a former youth art student. If that youth might be you - please check out our collective page, or reach out via email!